Ring in the New Year on Mackinac Island from December 26, 2014 through January 2, 2015. Your Mackinac Island Holiday is made possible with special openings from six lodging facilities, two restaurants and the always open Doud’s Grocery store. Several shops also open just for this holiday. 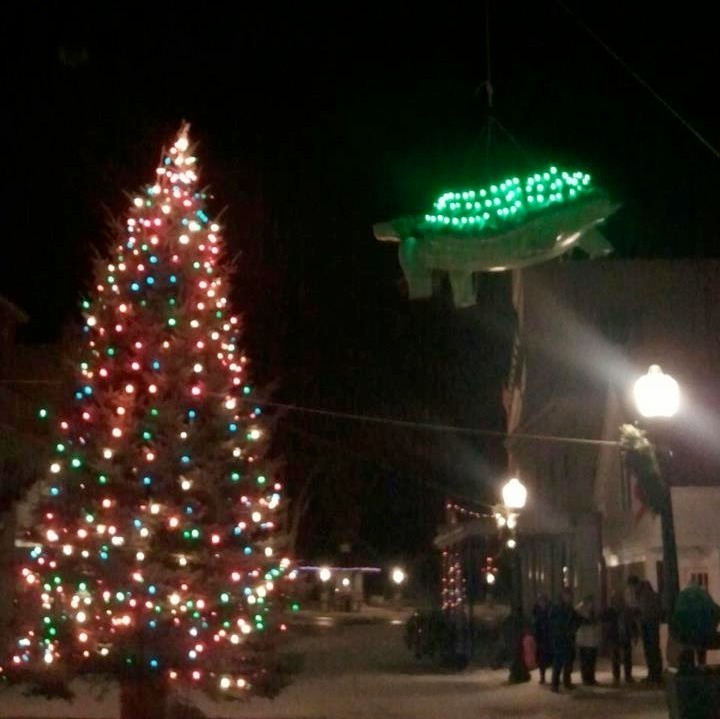 Join us Downtown at Midnight to welcome the new year with the Great Turtle Ball Drop before heading back inside to warm up and celebrate the New Year with live music. Spend your days cross country skiing, snow-showing, snowmobiling and hiking in pristine winter conditions. And spend your nights in the intimate lounges and restaurants. This New Year Holiday, Make it Mackinac. December 31st from 2pm to 4pm head to Marquette Park for the 2nd Annual Snowball Dash. Teams compete in the snow in events like a 3-legged race, wheel barrel race and obstacle course! To participate, show up with a team or two or more to Marquette Park at 2pm. 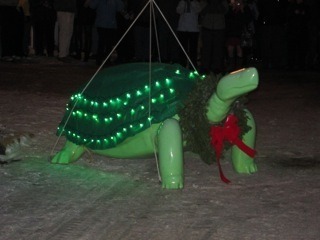 The Innkeepers at the Cottage Inn dreamed up the Great Turtle Drop as Mackinac Island’s version of Times Square and it was so well received that they are lighting up their turtle again this year. The drop takes place on Main Street at the Christmas Tree around midnight. Cawthorne’s Village Inn is featuring a special menu starting at 5:00pm. Reservations suggested. Drink specials all night long with a champagne toast at Midnight! Live music by Brian Thomas starting at 9:30pm. New Years Day Hayride (906) 847-3542 – Four different hayrides offered. Reservation and deposit required. Call Travis at Cawthorne’s Village Inn after December 3, 2014. $20.00 per person. New Years Day 5K – This fun run is not timed. Leave from Doud’s corner on foot, ski’s or even bike at 9:15am. There is no cost but donation to the Mackinac Island Rec Department is encouraged. Doud’s Market – Since 1887, Doud’s Market has been nourishing Islanders and visitors. This full service grocery store offers fresh cut meats, fresh produce, bakery, deli counter, prepared meals, packaged liquor and lottery. Harrisonville General Store – Groceries, beer, wine, specialty items and jewelry made by Island residents. Located up Island in the Village. SomeWear on Mackinac – A fine boutique of ladies clothing, outerwear, scarves handbags and more. Located at the Grand Gatehouse Courtyard Shops. December 20- 21 from 11am to 4 pm. Mackinac Outfitter – Mackinac Island’s favorite outfitter, providing the most popular lines of outdoor gear and clothing since 1981. We are located on Main Street across from the Shepler Ferry dock. December 21- 24 from 1:30pm to 4 pm.